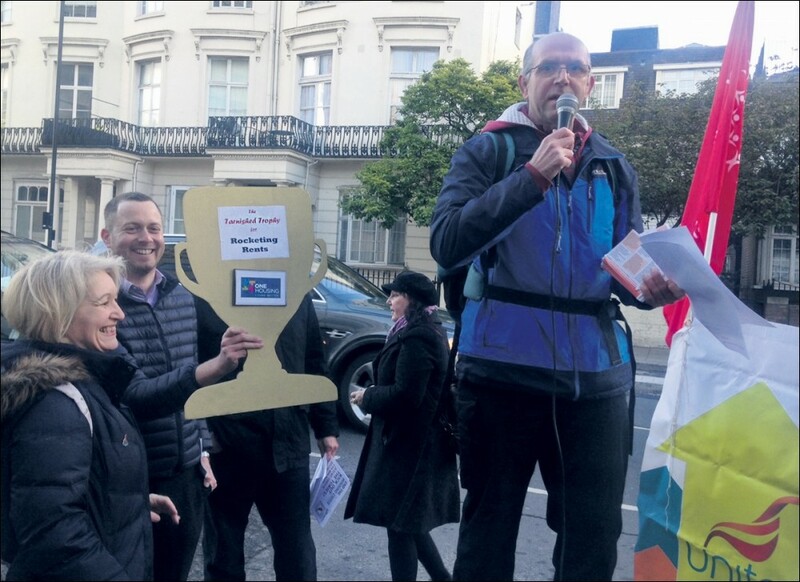 On 26 April, housing association (HA) managers filed in to an upmarket hotel in London for the Inside Housing awards (free food and drink for them, £1,980 per table paid for by their associations). 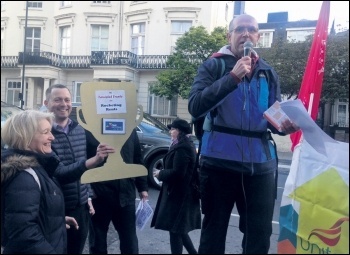 Outside 'alternative awards' for the worst HAs were presented in front of a lively crowd of housing association residents and workers. The newly created Housing Association Workers and Residents network had received 718 nominations for its alternative awards. Unite housing workers branch secretary and executive member Suzanne Muna spoke: "We're here to have a bit of fun tonight, but our aim is deadly serious - we want to remind HAs what they were set up for, and to demand decent homes, decent services and decent jobs and conditions." The 'overall lousy landlord' award went to Hyde housing. One of its residents said: "You can see the executives going in looking well-groomed in their bow ties and tuxedos. They're on salaries of over £200,000. Yet we're having to live with mouldy, damp, disgusting conditions because we can't get basic repairs done. My kids are always getting ill and miss school because they're sick. "Instead of using our rents for posh dinners, why don't they do something to make sure their properties are maintained?" Disgracefully, Hyde's chief executive Elaine Bailey has said HAs are guilty of creating a "dependency culture" and that residents need to take more "personal responsibility." The Bad Awards included: most rotten repairs (Genesis), soaring service charges (Family Mosaic), rocketing rents (One Housing Group), bullying bosses (Clarion), and poverty pay (Sanctuary), among others.